Clube Naval de Cascais and Portuguese SB20 Class Association are proud to present the Cascais SB20 Winter Series 2017-2018, and warmly invite all SB20 sailors to come and sail with us. 1.2 The Notice of Race of each regatta/series. 1.3 The Sailing Instructions of each Regatta/series, which in case of conflict will prevail under all the previous rules. 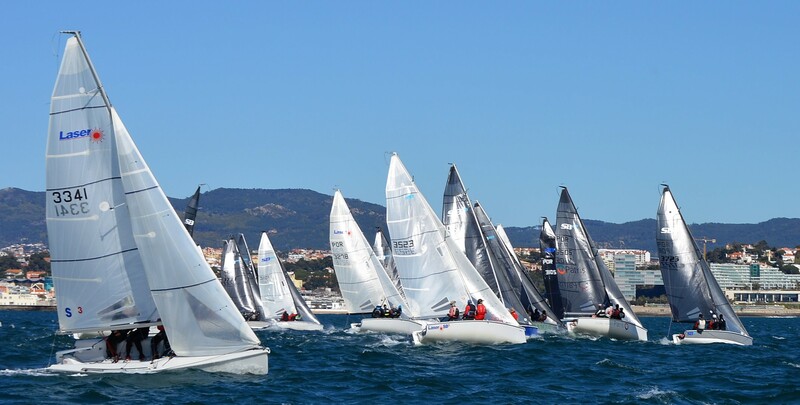 Competitors may be required to display advertising chosen by the event organiser in accordance with World Sailing Advertising Code – Regulation 20.3.1(a). Any required advertising material and instructions for their use, shall be distributed at registration. 3.5 The entry fee for the full series includes parking of the SB20 from November 1st 2017 to March 31st 2018. 5.2 Number of races: 33; number of races per day. 5.3 No more than 4 races will be sailed per day. 5.4 On Sundays, no warning signal will be made after 15:00. The sailing instructions will be available to all competitors during the registration period of each series. The courses to be sailed will be windward/leeward with a offset mark. For the SB20 class, rule 44.1 is changed so that only one turn, including one tack and one gybe, is required. 9.1 Overall ranking for the full Series will be made with the final result of each series. There will be a 1 Series discard; all results are referent to the boat regardless of the skipper or helmsman. A boat that does not participate in a Series will be scored with the total number of boats registered in all Series plus one point. 13.2 The Race Committee may use VHF radio to communicate to the fleet, including the starting area, countdown to the start, OCS bow/sail numbers (to be communicated at least 2 minutes after the start), general recalls, black flag DSQs and postponements. Failure to make these broadcasts or failure to hear them shall not constitute grounds for redress. This changes rule 62.1. Clube Naval de Cascais have negotiated with Marina de Cascais special Week Packages for just 8€/day at parking Marina Mar. Tickets must be requested until the end of the entry deadline of each series and will be distributed at registration. The Organizing Authority stablished an agreement with the Travel Agency “Em Viagem, to help competitors to find the most suitable and affordable solutions for accommodations and travel issues. Outdoor parking and cranage in the enclosed premises of the Club is included for the full period from November 1st 2017 to March 30th 2018 for boats signed up for the full Series. Boats signing up for individual Series are entitled to 30 days FREE parking around that Series dates. For other periods parking will be charged at an 8€/day. The club can arrange special conditions to transport boats from all over Europe, including picking up boats coming from the ferry boats in Santander or Bilbao. The Organizing Authorithy stablished an agreemment with the Pestana Cascais Cidadela for its proximity to the Clube Naval de Cascais with the following room prices throughout the year.